Bentley Motors has taken fine dining to the top of the highest mountain int he UAE, Jebel Jais by opening a restaurant for just seven days. The restaurant “The Peak of Luxury” will serve just 150 diners a menu comprising classic British dishes that have been specially curated by renowned chef, Colin Clague. Bentley constructed the restaurant to mark the launch of its models, the Continental GT and the Bentley Bentayga in the Middle East and to showcase the levels of bespoke luxury Bentley delivers through experiences that are truly one of a kind. The luxury restaurant is located on the summit of Jebel Jais, 1,934 metres above sea level, and is evocative of a traditional Arabic tent with its décor that is marked by hand-picked contemporary furniture, the use of sumptuous materials and unrivalled views across the mountain top. 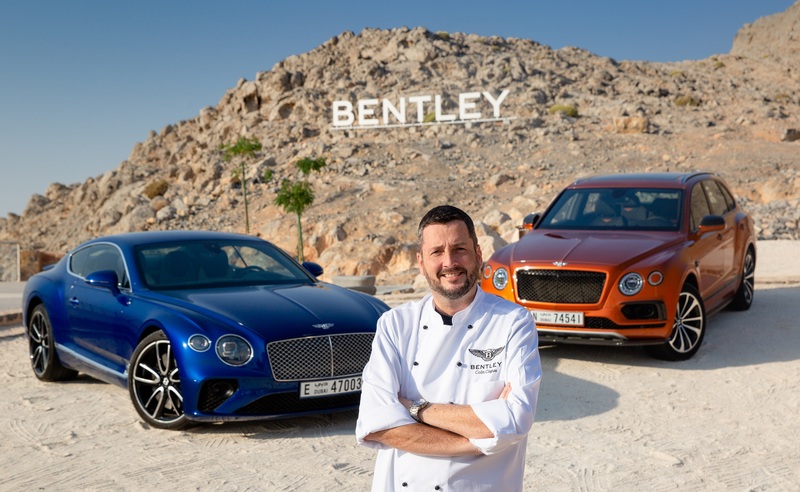 Chef Colin Clague, who has worked in leading Middle East restaurants including the Burj Al Arab, Ruya and Zuma curated a bespoke five-course menu which is inspired by the luxury and performance traditions of Bentley Motors and its history in grand touring. He has used the finest local produce to customize each classic British dish with a Middle Eastern twist. Known across the globe for its dynamic twistJebel Jais is known for its mountain pass roads, and these roads will serve as the perfect testing ground for the all-new Continental GT and sporty Bentayga V8, Bentley’s models which have been launched recently in the region. The Bentley Bentayga is the brand’s first SUV and is powered by a V8’s 4.0-litre twin turbocharged engine having an outcome of 542 bhp and the ability to go from 0 – 100km/h in just 4.5 seconds. The vehicle’s powerful engine, sleek twin-quad exhaust pipes and optional carbon-ceramic brakes, which are known to be the largest front brake system in the world are its most notable characteristics and attest to its sporty nature. When it comes to the interiros, they use a combination of opulent handcrafted materials and advanced technologies to create a highly refined atmosphere. The new styling features include a wood and hide steering wheel and the introduction of a high-gloss carbon-fibre interior panel finish. The all-new Bentley Continental GT, the third generation of the model is the ideal luxury grand touring vehicle. Designed and made in Great Britain, it represents the best of luxury engineering with its combination of natural materials and cutting-edge technology. The new Continental GT is powered by an advanced version of the brand’s renowned 6.0-litre W12 TSI engine, which can deliver 626 bhp and goes from 0-100 km/h in only 3.7 seconds. It comes with a new dual-clutch, eight-speed transmission for faster, more efficient performance. Colin Clague, the Executive Chef at Ruya, said that working with Bentley, an iconic British brans was a very unique experience. He said that he had worked in many kitchens in many countries across the globe, but had never served dinner in a completely bespoke restaurant on the highest mountain in the UAE.